Second post. I’m going to be honest with you, folks: I already had ideas for additional posts when I wrote the first one saying that it would probably be the last. I just didn’t want to get everyone excited about new posts if I decided that shooting pixellated zombies was a better use of my time than writing a blog. I’d like this blog to be the $5 bill that you find in the pocket of your spring jacket after you have taken it out of winter storage: unexpected and delightful. It’s not going to change your life, but it will hopefully put a little smile on your face. Also, since I used a simile instead of a metaphor to describe the $5 bill/blog post relationship, this post is that $5. Mine. Send it over. Tens and twenties count, too. Ok, here is a little “getting to know you” bit, since my lovely bride shared the first post on The Twitters and now a bunch of people who don’t know me have read it. Here is what I do: I take photos of squirrels. To pay the bills, though, I am a packaging development engineer. I have a bachelor’s degree in Packaging. Seriously. Before you start giggling about what a silly thing that is (a coworker just gave me that skeptical look a few days ago), try to think of the last thing you purchased that didn’t come in some kind of packaging. Last time you ate a can of tomato soup with your grilled cheese, did you die of botulism from that 2-year-old can of soup? No? You’re welcome. 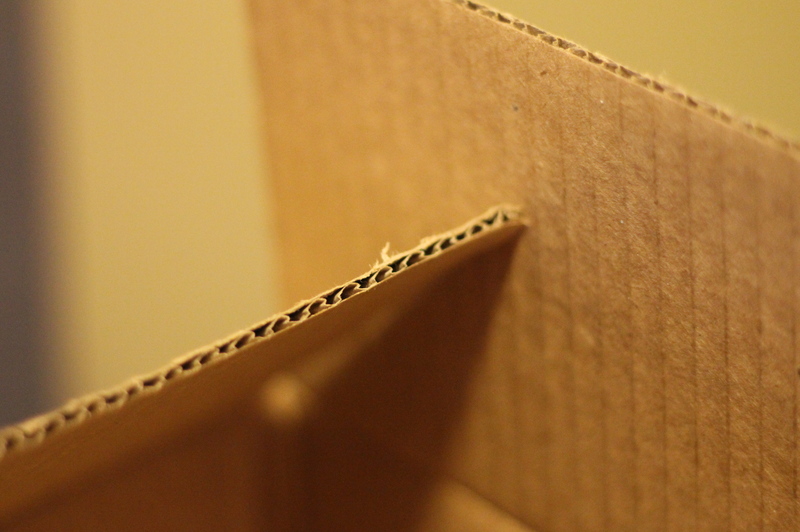 You say cardboard, we say corrugated fiberboard. The funny thing about my job as a packaging engineer is that, even after 12 years, I don’t think any of my friends have any idea what I do. I’d say that when most people tell you their job title, you know what they do. If that’s not specific enough, they can probably sufficiently elaborate in a sentence or two. My stock response is – and I know I’m not the only one that says this: I make boxes. That’s not really everything I do. Sometimes months go by between boxes. But that response gives most people a chuckle and then they change the subject. That’s OK by me, because my work is pretty varied and not frighteningly interesting to outside parties. Anyway, I had classes about paper, glass, plastic, temperature and humidity, packaging equipment, shock and vibration, stuff like that. I was told by a professor that Packaging is all about breaking stuff. After you’ve broken the product (and measured what it took to break it; you did measure that, right?) then you design a package that will protect the product from the environment. Well, after you graduate from Michigan State University’s School of Packaging (you did go to MSU, right? ), you will have all sorts of knowledge about all sorts of packaging. Awesome! Unfortunately, there are things that they don’t teach you at the School of Packaging. Things that you might have to learn through painful experience. Well, I’ve been doing the packaging thing for a few years now, and hopefully my pain can be your gain. So this may be the beginning of an intermittent series of posts consisting of tips for the new packaging engineer. Even the ones from UW-Stout and RIT. This is all based on the assumption that there will be more posts after this one. Thought Show and Tell died out in kindergarten? You couldn’t be more wrong. There is no meeting that cannot be improved by having actual samples on hand. It almost doesn’t even matter what you bring. Designing a new carton for a product that you’ve been making for the past 40 years, but don’t have a sample of the new carton? Bring a few pieces of the product. It doesn’t matter that everyone already knows exactly what the product looks like. Bring it anyway. Most meetings people stare at the agenda (or Blackberry) while someone talks. Booooring. Bring something to pass around and now it’s a party! I’m serious when I say that most times I have gone into a meeting with something other than just a folder in my hand, people will say something along the lines of, “Somebody tap a keg! We got samples!” This all goes double for meetings with Marketing. They eat that stuff up. I once worked on a project to design a box that was the size of a pallet. (A modified D-container, if you wanted to Google it.) That makes it somewhat awkward to bring to a meeting. So, in the spirit of Show and Tell, I brought back Arts and Crafts, too: I spent 20 minutes with a pair of scissors, a couple of my business cards, and a glue stick and made a roughly 25 mm x 25 mm x 25 mm (metric rulz!) version of the container that I could take to meetings. It was awesome. It was adorable. I was complimented on it. It had my name, title, and phone number on it. It also made it a great deal easier to describe the package. I wish I still had it. Be a rock star. Be a ray of sunshine in someone’s day. Bring samples. Welcome to my first, and probably last, blog post! I’m not going to introduce myself because, at this stage of the game, you are probably here because you already know me. Now that the non-introductions are out of the way, Your next question may be, “What is this blog about?” An excellent question. My lovely bride tells me that successful blogs need to have a distinct theme or direction. Over the course of this blog, I may even figure out what that theme is. Not likely though, because this is probably my last post. I’m starting this blog because most evenings, after I’ve checked Facebook and maybe a little Pinterest, I sit in front of the TV and do not learn to play an instrument or how to speak a foreign language. If Jenn (that’s my lovely bride) is watching something awful on TV (and most of TV is awful (Except you, HBO; you are wonderful! ), I tend to play Flash games. After all, those zombies ain’t going to shoot themselves. Writing this blog will exercise my brain and posting it to the internet will give the whole world something new to roll their eyes at. Of course, the whole world won’t have much time to roll their eyes at me, since this is probably my last post. I have, in the past, been accused of being a pretty good writer. I did win a short story contest in the 6th grade. I won a gift certificate (this was before gift ‘cards’) to The Book Place. The Book Place was a tiny independent book shop in the town where I grew up. Primarily, I bought Piers Anthony and Truly Tasteless Joke Books there. (Have you heard about the new restaurant, Kentucky Freud Chicken? It’s motherfuckin‘ good!) I recall going there once and my mom or sister commenting on a new release that they had on a little stand by the register. The clerk told my mom or sister that she could take the book for free so long as she came back and told them how it was. I don’t expect to see Borders doing that anytime soon. Sadly, The Book Place has been gone for years. Their run was longer than this blog’s will probably be. Another thing Jenn told me is that your first post doesn’t necessarily have to be that good. That is a great news, because what the heck is up with that paragraph? Free books? Dirty jokes? Wow. Tangent much? Don’t worry, this post will be over soon, and the blog probably will be, too. So basically, there is no direction for this blog. Not that big of a deal, since this is probably the last post. In the unlikely event that there are future posts, they could be about a range of topics. At this moment, we’re probably looking at some squirrel photography posts, maybe some posts about why the beer I like is better than the beer you like, perhaps a post on why I don’t like doing dishes. Once the weather starts to be more consistently warm, you might see some posts on cycling and running (which I seem to be doing much less of). And maybe this year I’ll get out and play some more paintball. Then instead of coming home and boring Jenn with stories about it, I’ll bore the whole world with stories about it! Not likely, though. This is probably the last post. P.S. The dog just farted. It smells bad.